I was practicing herding with my dog, and all of a sudden, one of my female ducks lets out a horrible squack, and blood starts pouring out of her leg. And no, the dog was back and didn’t cause it. My poor duck was gashed down to the bone. 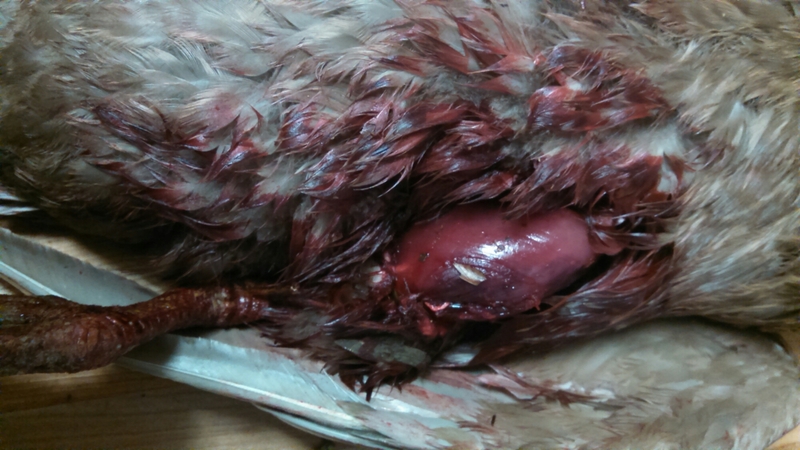 Apparently, this is fixable, but I didn’t know any better at the time, and this poor bleeding duck caused me to panic. Since I got an order in my raw food business for duck, I decided to save her from potential infection and cull her. It was so hard processing a duck that was so full of eggs. I found glass in the wound, and it is so hard losing something to a freak accident. That happened in Saturday. Well, Wednesday, I did my chores and found that Magyck’s cover had come off the cage. It was in the upper 80’s, and even though she isn’t exposed for more than a few hours to direct sun, it was enough to give her death from heat stroke. I feel awful, if I had checked on her when I got home from work, she may still be here. But most likely not. This is the incentive I need to get a permanent installation in a more shady area of my yard. Drat! I feel like such a sissy for getting tears in my eyes twice this week, but I really love my animals.